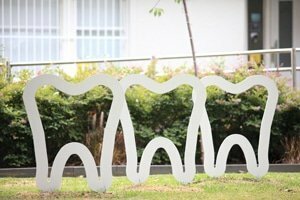 The sculptural bike racks outside Churchill Eco Dental Care are both pretty and practical. 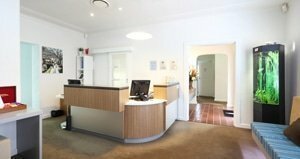 In front of the Churchill Eco Dental Care practice in Sydney’s northwest, a set of three sculptural teeth act as an artistic beacon for dental professionalism. But when you look a little closer, it’s more than just an artwork—they are functional bike racks that were installed to let patients know that this practice is environmentally friendly on the outside and in. The practice’s green commitment first occurred when co-owners Dr David Le and his cousin Dr Thomas Vo met architect Barbara Busina of Atelier Busina. They had been running the surgery for seven years after a minor renovation but the two dentists were ready to expand their operation. “We were getting more patients and having more dentists working with us,” says Dr Le. Barbara Busina and the dentists spent more than a year going back and forth, talking about ideas and incorporating sustainable elements into the design. They could see the renovation unfolding in two stages, starting with two extra treatment rooms. “For financial and logistic reasons, it needed to be a long-term plan,” says Dr Le. The second stage will eventually include two offices, a larger reception area and a green roof. While he embraced Busina’s early designs and drawings, the council’s application process for development approvals turned out to be a longer drawn-out process than originally intended. “We had an overall vision but everything needed to be modified in order to get approval from Parramatta Council. It was a difficult time,” recalls Dr Le. Once the construction of the first stage began, Drs Le and Vo decided to keep the practice running and the build met the five-month timeframe in October last year. 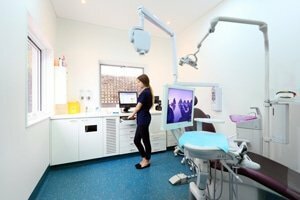 During the next stage, they turned to one of the practice’s longest serving staff members, Lisa Jones, who has been in the dental industry for 12 years but is also a qualified interior designer. Her goal has been to reduce as much energy and waste as possible. Dr Le admits that there was an adjustment period as the team had spent years developing a good system. “Changing the whole way we work had its difficulties but we’re getting there,” he says. The two new treatment rooms boast eco-friendly materials but also retains a strong connection with the original elements. The carpet and vinyl flooring, for instance, match the existing flooring colours but are produced from low-impact eco-friendly materials. The main colour palette of the extension is white and clean—“really crisp but not sterile”, says Busina. With the completion of the first stage of the renovation and the addition of new equipment and instruments, Drs Le and Vo are well on the way to obtaining their eco-certification. “We still have a way to go but ultimately we would like to be green in every sense of the word,” says Dr Le. While the practice, its systems and processes are certified by the ADA to a high standard, the Eco Dentistry Association certification requires a new level of usage. “We have to turn off lights and computers whenever we can, track our consumption, minimise wastage and recycle as much as possible,” he says. 100 per cent film free. Using digital imaging for patient radiographs, inclining PAs and OPGs and our imaging software to record and display the radiographs. Reducing plastic consumption. The practice has reduced 90 per cent of paper-plastic pouches with cloth, reducing its plastic consumption. Reducing consumption. Using cloth lab coats instead of disposable lab coats. Reducing packaging consumptions. Using bulk-buy dental materials in larger containers, instead of single-use disposables, eg. prophy paste cups. Recycling up to 100 cups a week. “We use biodegradable cups for ‘rinse and swish’, and our patient welcome area,” says Jones. Promoting re-usable products. Giving away re-usable cloth bags to patients at home; they are full of supplies and samples such as re-usable toothbrushes/floss instead. Replacing disposables with permanent solutions. Switching over to permanent equipment instead of disposables, eg. stainless-steel impression trays and stainless-steel suction tips; using cone socket hand instruments. Enabling eco-transport. Provide bicycle storage and changing facilities for over 30 per cent of staff and patients within the clinic.